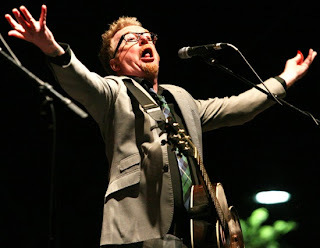 Just as many have the St. Patrick's Day tradition of mistaking St. Patrick for an Irishman, my long-standing St. Patrick's day tradition is to see the Flogging Molly headlined Green 17 Tour every year. Why we're lucky enough to get the Irish-folkie-punk-rockers every year? Well, remember that little alt-rock radio station 103.9? Once known as the Edge then the X that is no longer with us? Well, they gave a big boost to Molly years ago helping them go from simple LA bar band with a cult following to what they are know. The band looks at AZ as a place that helped them get going and respects that, this was their 8th year playing St. Patrick's Day in AZ. 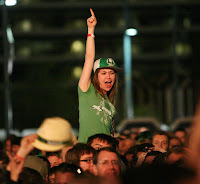 I suppose it's time for me to "get over it," as even though I've been going to these Flogging Molly St. Patrick's Day bashes long enough to remember the good ol' days at Mesa Amphitheatre, they've know been here at Tempe Beach Park longer than they ever were there. I love Tempe, it has some great places to see concerts (many dive-bar type locales) but I'm still not the biggest fan of Tempe Beach Park. It's colder and windier, I like a more traditional amphitheater set-up, and while it being located there means it's more popular (we had a larger St. Patrick's Day bash than Boston, believe it or not) it also means it's more "douchebag" friendly. This was a hit and miss affair. I think the worst thing is the band tried to move their mostly stripped down percussion sound more-so punk rock than it needed to be, I suppose thinking that's what the crowd wanted, and so it didn't translate as well live. "Paparazzi" is a perfect example of this happening. They were already hit and miss for me as far as their songs, so then doing that live didn't always work. I was also disappointed they didn't play "I Hate the Beatles," but they still nevertheless brought smiles to my face. Sometimes for a decent song, sometimes because the lead man looks like a Brazilian Billy Idol. Highlight of the Night: Just seeing a band from Brazil is a pretty cool thing. Even though (as I mentioned earlier) it didn't translate as well live, I enjoyed their "Brothers of Brazil" self-titled tune. That and hearing the lead man occasionally tell "F**k you" to various well known people. A surprise for sure, as they were an enjoyable, low key, 30-minute set to sit through. 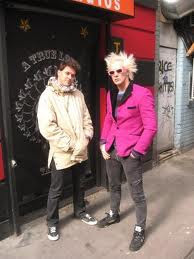 You may know Zander from the Circle Jerks, but anyhow it was just the two of them. So the production wasn't as full as the album, but it worked live in an even more-stripped down way. 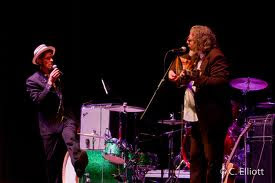 They had funny in-between song banter and continued to keep the punkers attention. It was surprising being this type of crowd that this early in the show so many folks were paying attention to the band more than their beer or merch/vendor lines, but it just goes to show: If you have an interesting sound, some good songs and those Levon Helm raspy-eqsue vocals, you can get folks to listen. Highlight of the Night: Not sure which song was my favorite, probably "So Low She Rose." Also enjoyed "Song about Songs" and "Retablo" a lot. A surprise addition to the show. The worst part of these Green 17 tours can be the opening bands, this is by far the best line-up I've ever seen at a Molly show, though this band took the cake for the worst. They were boring, repetitive, and too often sounded more like a wannabe bad-ska band from the glory days of 1999. I'm sure some people enjoyed it, but then again I'm sure some people enjoy going to the dentist or giving blood. Highlight of the Night: The moment they walked off the stage. Then more time then and this one joined in...and about a dozen more. Stay classy, ladies! I love the Tempe sound, I love the Tempe bands. 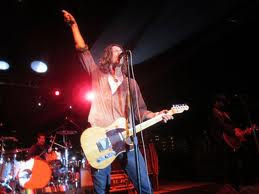 I like Roger Clyne a lot, this isn't my first time seeing him either. However, I will say this, he always works better as an opener rather than the main focus of the show. Seeing him in the 30-45 minute range seems to work just about perfect, anything more would be overkill. I think Clyne probably had a bittersweet feeling when Doug Hopkins killed himself in Decembe of 1993. Sad that his friend died, happy that he no longer had to compete with him. No matter how hard he tries, his riffs just don't match up, and his lyrics never quite capture the sweet mixture of pop and melancholy that Hopkins could. Clyne's best known song, from his Refreshments days, is probably "Banditos," and it pales with a lesser Hopkins track like "Southbound Train." I'm not dogging him, but as fun as Clyne can be, he'll always be the B-Version of the Tempe sound, behind the Gin Blossoms and Pistoleros. The only other thing that annoyed me about the show was his constant "see you in Mexico!" and "ppppeeeerrrrffeeecccctoooo! "'s he kept shouting out after every song. It's cool you have a benefit concert coming up in Mexico that you do ever year, Rog, but let's be honest, 98% of us aren't going to it. But then he'd launch into a good tune like "Heaven on a Paper Plate" and I'd forget all about it. Highlight of the Night: During "Bandito's" someone rocket launched a neon glow-stick from way back in the crowd onto the stage, mid-solo Clyne catches it with one hand and launched it right back out. That was pretty cool. I probably dogged on him too much in the review, but Clyne put on a good show, maybe went 5-minutes too long for my taste, but it was good. "How many years have we been doing this Arizona? Ah, it's St. Patrick's Day...or as we like to call it, every Saturday Night..."
In the early days of these St. Patrick's Day shows, Flogging Molly would usually hit the stage at 8 or so, and you'd be in your car no later than 10:30 or so, ready to go somewhere else to finish the night. Tonight however, Molly didn't hit the stage until just before 10, to the sound of Johnny Cash doing Bob Marley's "Redemption Song." Despite the time, they came out and still put on a two-hour show. This one all in all was quite worth the money, which is nice. 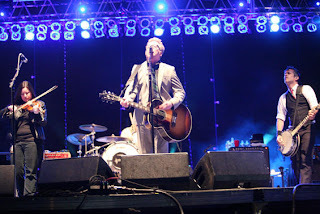 At this point I've seen Flogging Molly enough live, and I've seen enough other bands live, to know they are without a doubt one of the top-5 best live bands in the world. Their songs are good on record, but transcend live in a way that's hard to describe. Their mixture of traditional Irish music and folk with rock and punk rock SHOULDN'T work, it should only result in far too many people on-stage. But it does work, it always works. They mix hyped up songs that get the crowd - both drunk and sober - going like no other, and can still break it down into a slower acoustic number like "The Sun Never Shines on Closed Doors" and the crowd still sings along as into it as when they hopped around like jackrabbits to "Drunken Lullabies" or "What's Left of the Flag." The worst part of the early years shows I saw, was by year three, the set lists dragged a bit, knowing they only had three albums to choose from. Then Float came out and I didn't really dig it, so even the new additions didn't add much. However, their newest, Speed of Darkness is a really solid album, it mixes the maturity Float tried to have but doesn't feel forced, it's not their best album, but a solid entry into the canon. They did play a couple Float songs, and while they've actually grown on me a bit, but still as Dave King sang "No Don't, Don't sink the Boat..." I sang "no Don't, Don't sing from Float..." I thought I might get some dirty looks, but on one side I had the drunk lesbians who were acting like it was a ska show, someone with a "My name is Pat McCrotch" hat on in front of me, and a group of hipsters literally just taking pictures of each other with their DSLR's to the left of me. Interesting crowd indeed. A mosh pit started up right nearby but I didn't have to punch anyone, sadly. I did give two tools a death glare, they were just talking smack about everyone, I gave them one look and the quietly got up and left though. All in all though, a fantastic show, the best I've seen from the band since '06. The usual highlights were indeed highlights, as was Dennis Casey's long, drawn out crazy hump the guitar and break two guitars solo during the bridge of "Black Friday Rule." It was also nice to hear King throw in a lot newer banter between songs than previous years. The encore rose above for me, as one song into it King says "We'd like to do a song by the greatest songwriter who ever lived. He wrote this in 1964 and it could have been written next year, it's still so relevant." They went into my man Bob Dylan's "The Times they are a-Changin'," in pure Flogging Molly style, and it worked it's socks off. I could have used a little "Another Bag of Bricks," but hey, it was a 23-song setlist that had little else to complain over. 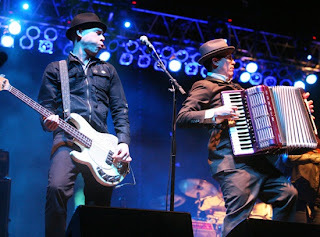 Highlight of the Night: Dancing like a douche with Lady-Hawk was my highlight of the set, song-wise, it was the pure thrill of hearing Flogging Molly, one of my favorite bands of more recent eras, cover my all-time favorite artist. Very cool guys.